On a rare day, I'll eat something so good that if there's anything better, I don't want to know. Last week I was fortunate enough to bring down my gullet the nuttiest creamiest most delicate ankimo ever. Ankimo is the liver of the monkfish- a critter unfortunate enough to be endowed with an unusually large and delicious tube of liver. Ankimo is oft said to be the fois gras of the sea and is equally fraught with moral dilemma. From the lovely presentation above, you would never suspect anything to be amiss. Monkfish is caught predominantly by indiscriminate trawling which is a terribly destructive way to go about pleasing liver loving saps like me. There are many things in life that are so wrong yet so good. The gustatory pleasure really overrides any sense of shame I should feel. If you've made up your mind to do something against your principles, you might as well enjoy it and not feel guilt. You can see I was not raised Catholic. 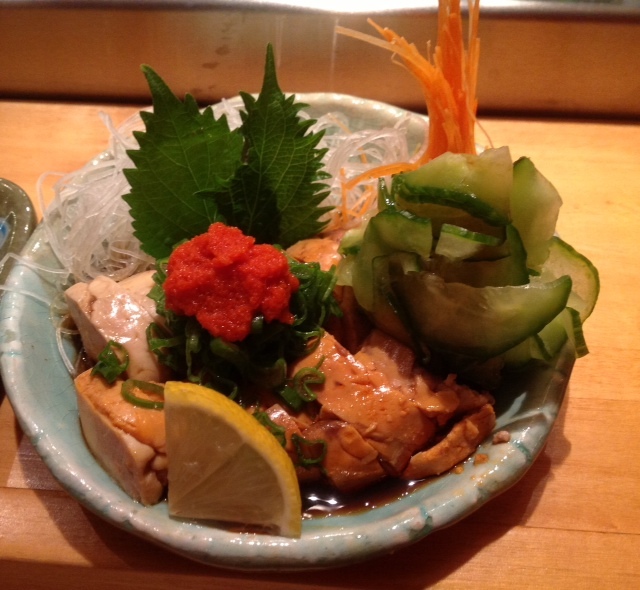 This particularly stellar example of ankimo was served at Sushi Sho. The chef Aki-san, who my husband dubbed Sake-san since he kept slugging surprising amounts of sake between sashimi sets, worked skillfully in putting our dinner together. You can see he did not skimp on the momiji oroshi - grated daikon with red chili pepper. "Momiji" is Japanese for maple or autumn foliage; Japanese are fond of poetic references. There is a cult of sushi eaters who swear by specific chefs who manage to procure the "freshest" fish possible and present it skillfully. Much of the raw tuna and other sushi served at sushi restaurants has been super frozen and jetted around multiple times. The process of super freezing to -60F allows the sushi to store perfectly for years. Our ideals of freshness and the realities of industry practice can easily be hidden away as few diners really know what belies a plate of nigri sushi. I probably wouldn't be able to stomach sushi if I knew everything. Not just the environmental exploitation- there's exploitation of poor island nations like Kiribati and Tuvalu who have sold off fishing rights for a pittance. I better stick to California Point Reyes oysters and Dungeness crabs until I research a bit more. 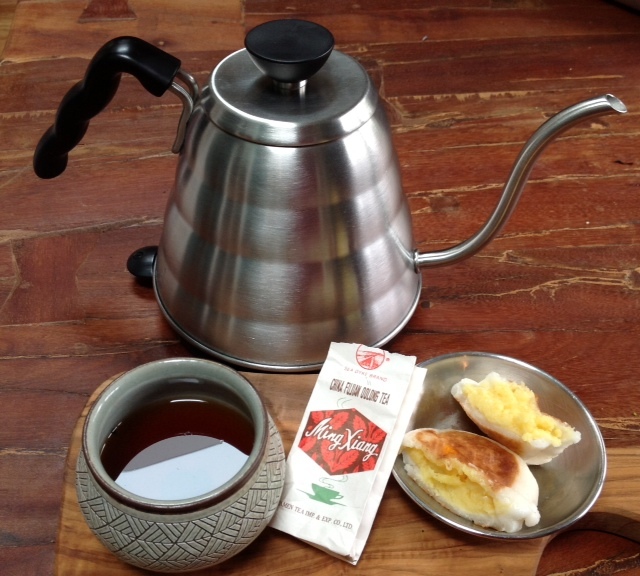 My desire for a tetsubin came about when drinking tea with Ira- her's produced a noticeably sweet delicous rounded water. 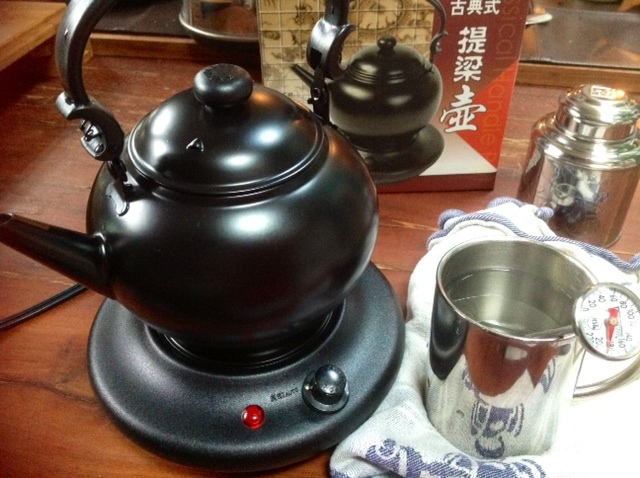 Even though I've budgeted sufficiently for a tetsubin iron kettle, even picking a reasonable candidate out from the ether is sapping my brain strength. I've been hit with a fit of spring cleaning lately and a solution for deferring a tetsubin purchase presented itself to me. 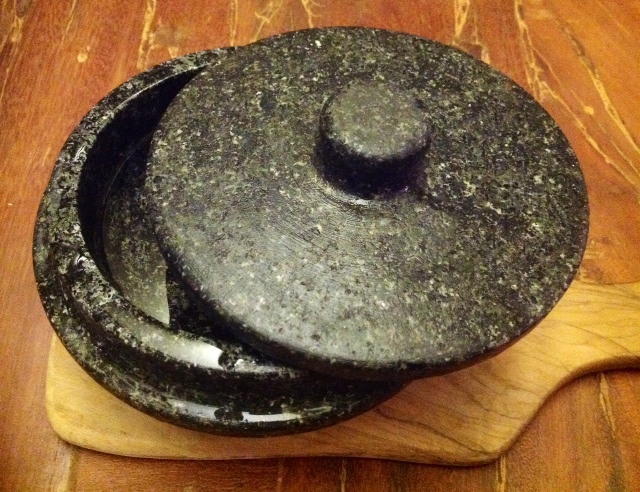 I used to make rice in this Korean granite stone pot called a dolsot and the rice tastes extra nutty when cooked thus. And although this particular stone pot can boil only small amounts of water which has to be ladled, it was worth trying with tea tonight. As it is Sunday night, I made mugwort tea for winding down. The tea brews extra refreshing and smoother than usual- the tea just glides across my tongue. When I taste just the water- I can taste a slight mineral profile. I hope I don't get kidney stones but probably I need the trace minerals. A small part of me knows I'm not the kind of mindful person who can take care of a tetsubin. (Actually I already have a rusting one on top of the fireplace that I use as a steam maker.) You can definitely leave water in this stone pot overnight- one just has to be careful not to pour cold water in a hot pot. And if it does break, it's less than $30 to replace. 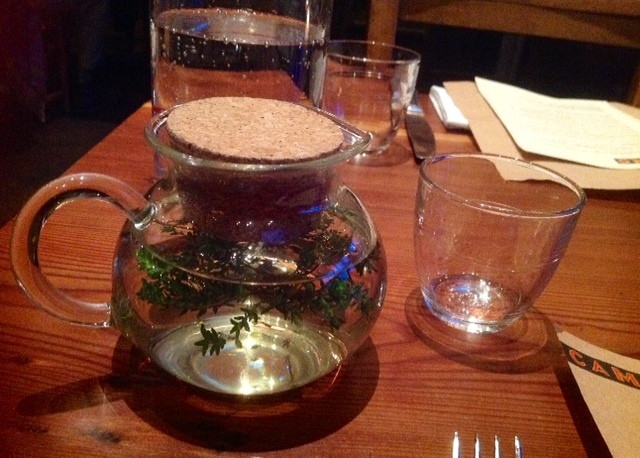 Last night at dinner, I was at a loss to order tea so I opted for a thyme tisane. You can see it's just a few sprigs of thyme in hot water and it tastes exactly as expected- herby. It could have done with a spoonful of linden or orange blossom honey. Restaurant tea is bit of a gamble. When you are a serious tea drinker, it always seems wrong to order tea at restaurants that don't specialize in tea. I really wish that similar to the standard practice of "corkage", restaurants would charge a "brewage" fee and let patrons bring their own tea. This teapot arrived from birdpick.com on Monday and it only took one wash with detergent and two boils to produce perfectly acceptable water for delicate tea. I brewed up a floral oolong from a Taiwanese neighbor and the result was as floral as ever. Although this teapot is a bit chintzy and offends my sensibilities, I'm utterly grateful not to have any off taste in the resulting water. I had vague notions that reboiling water makes for flatter tasting water and hence less tasty tea and so I purposely got the smallest 3 cup model. The arguments against reboiling appear to hinge around decreased oxygenation levels. I have not comprehensively and objectively confirmed this prejudice but a simple casual experiment with this Kamjove would indicate that reboiling does not appear to significantly impact my taste of a tea or the underlying water. As a safety feature to prevent water from boiling when empty, the base has three little pins that push down when the teapot is sufficiently heavy to trigger a boil. 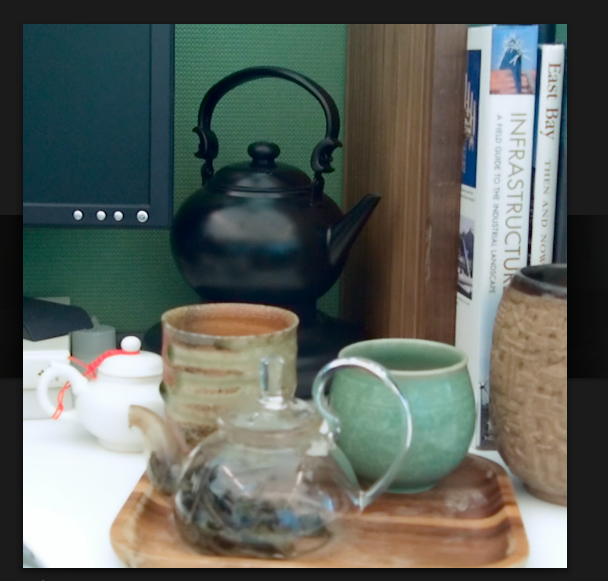 But even when the teapot is half full, it's fits a bit wobbly and I have to manually hold it down to get it to boil. It's not my dream kettle but it will do. Also it is very quiet compared to the jet engines of the Hario Buono. I really wonder how long this contraption can last. At $37, I guess even yearly replacement should not injure the wallet too much although I would much rather invest in a long lasting deluxe kettle. Normally I don't set a hard budget to control any of my habits, I try to keep a eye on it from time to time. 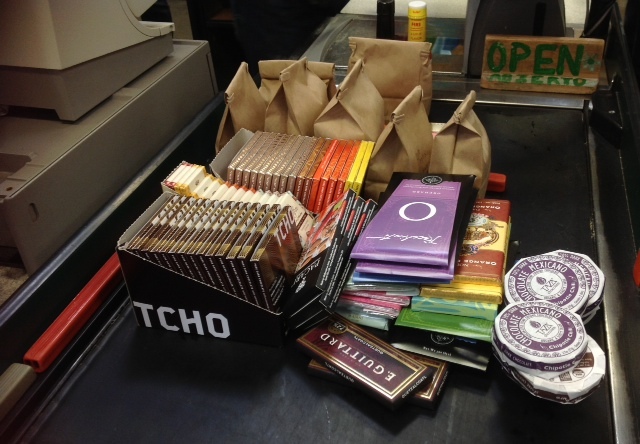 But a tiny alarm bell tinkled in my head when I ended up buying $400 worth of chocolates in a single day. But when you are constantly handing out multiple bars to people who need cheering up, even a supply such as this can last only a few weeks. I'm aware my chocolate budget is now heartily eating into my tea budget. Fiscal prudence is a virtuous habit which can be forced upon you sometimes by painful necessity. Fortunately I'm saving to fulfill a fantasy. While in Hawaii- I noticed parcels of ocean front land in Puna for sale which I could buy if I was more modest in my current lifestyle. All discretionary spending is now on review. So I'm about the business if officially setting my tea budget this morning which should include all tea, tea wares, and shipping. I thought of a pleasing round number like $1000 which I could easily spare because I don't own a smart phone. While many of my friends are a slave to their monthly iphone payments (~$85/month or $1020/year), I have a burner phone which costs me $10 every three months. When you think of lump annual sums, they appear more formidable. While limitations in theory force a more careful use of one's resources, a person unused to such discipline could crack else where. Starting next week, instead of handing out multiple chocolate bars, I'll just have to share chunks of a single bar. A twinge of regret already forms in my mind and friends might be confused at this new policy of stinginess. I've been tea miserable at work. After days of research, I paradoxically ended up with what turned out to be the worst kind of electric kettle. I exaggerate as the worst kind of kettle probably would have caused an electrical fire and burned down the building. The boiled water from this Hario Buono merely ruins the taste of any tea I try to brew. Otherwise, it's solid and the gooseneck provides superior control and I'll be more than happy to use it as a watering can for my plants. This tea kettle had no Amazon reviews at all when I sprang for it. I was lured by the stellar reputation of it's stovetop counterpart. This Hario Buono has a plastic cap on top of the vertical heating element and although the water does not touch this plastic part, the steam condenses on it, drips down and causes the water to taste quite toxic. The burnt plastic taste and smell to the water outright kills any tea even the lapsang souchongs. For pathological reasons unknown to me, I've been soldiering on with this terrible travesty of a kettle. Two+ months of use has not yet lessened the smell. Last night in final frustration, I was determined to start life anew with a superior kettle. After rereading every kind of complaint ever recorded against electric tea kettles on Amazon, I was at a loss to order yet another faulty specimen. What do these unhappy consumers of inferior kettles complain about? I can't seem to find a quality durable electrical tea kettle without plastic parts. I think Sir Dyson should set his attention to this most grievous problem. At home, I have a trusty Russell Hobbes that I've been using for ten years but the new versions are no longer any good. In a fit of bleary eyed fatigue, I sent away for a Kamjove from birdpick. If I'm going to buy some cheap Chinese made kettle, I might as well get a kamjove. Although I really wanted the titanium-plated golden hued Kamjove, 200V is a no-go for me at work. My husband in a fit of generosity offered to hook up a 200V outlet for me although he said after a single glance at the bell shaped kamjove- "It's not going to change your life." After a dinner of broiled mackerel, one's palate really isn't fit for anything delicate. I wanted a tea which could stand up to my dessert of raw milk blue cheese accompanied by a toasted almond croissant. Blue cheese is commonly paired with chestnut honey and so I thought shu would be a natural fit. Chestnut honey can be quite pungent and dusky like a shu. I pulled this 07 Nannuo out for no other reason than it was within easy reach. I remembered being moderately pleased with this beeng last year. With budget shu, I always have such low expectations- if I'm not grossed out, I'm happy. No hint of wodui remains. This shu is not merely inoffensive- it's robust and notch (or two) above mediocre. Bites of the sharp blue cheese and marzipan really bring out the round sweetness of this tea. I may start pairing shu's with more dessert and cheese. 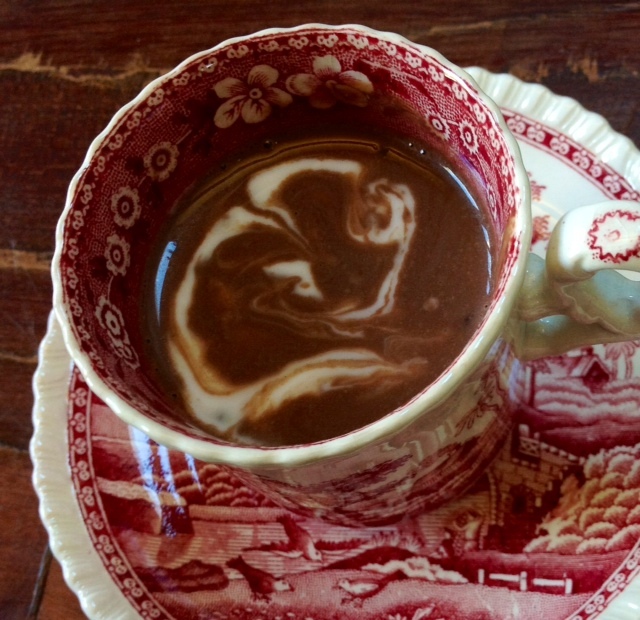 When I'm in need of cheering up, I often make myself a cup of hot chocolate which I prefer to hot cocoa. Melting even a third of a chocolate bar produces a thick rich mouthfeel from the cocoa butter- the simple luxury of such a cup makes one feel life must be good. I normally use either almond milk or hazelnut milk as a base with budget dark chocolate. I finish it off with fresh ground pepper, a dash of sea salt, and a splash of brandy. For extra goodness, I swirl in a dollop of coconut cream. When I was in Barcelona more than a decade ago, some of the cafes served incredibly thick almost pudding-like hot chocolate which I loved. I suspect corn starch was involved- something I won't do but I will add corn meal or cream of rice if I crave a chewy thickness. Of course a baked treat to dip in this goodness makes it extra special. It's important to own simple sure-fire ways to lift one's spirits. I've been beset with puerh performance anxiety. Puerh sessions have been stressful for me lately and demands too much of me. Perhaps it's my approach and expectations. I tend to seek excitement and adventure in puerh while I look only for comfort in hot chocolate. I guess it's time to revisit some standard shus. When Americans feel the dreariness of winter and life in general, many will pack bikinis and speedos and try to escape to a warm island paradise. While my belly has modestly never been on display at a beach or any public venue for that matter, I am all for underwater action in sunny climes to squash the winter blues. I had years prior planned a trip to Raja Ampat but presently didn't feel up to coping with the vagaries of remote travel. The internal flights between the outer islands is notoriously unreliable and the third leg of travel involves the Sorong Airport also known as the infamous SoWrong airport. 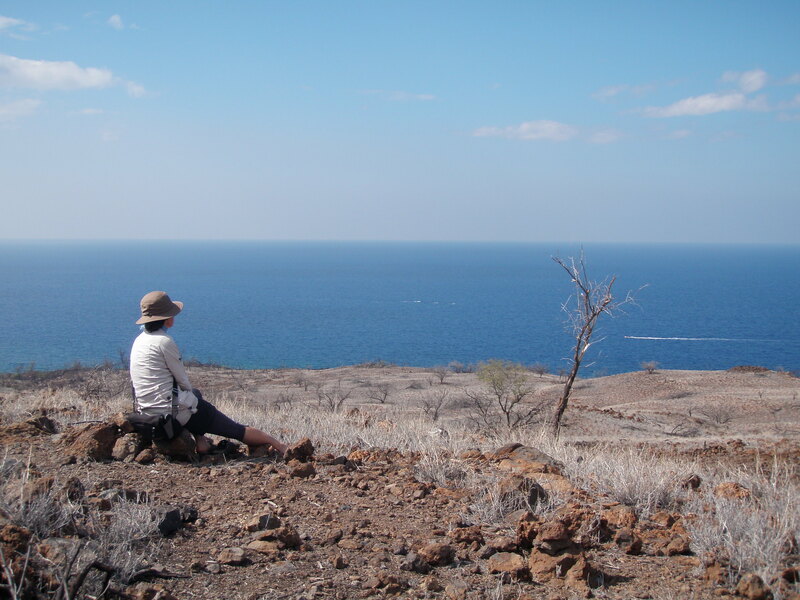 One day I will be SoWronged but this year I opted for the infinitely easier route of visiting a friend on the ever welcoming Big Island of Hawaii. Our friend alerted me only the day before travel that her partner K wanted to cultivate a tea habit. I excitedly but hurriedly threw in various tea in a box for him. 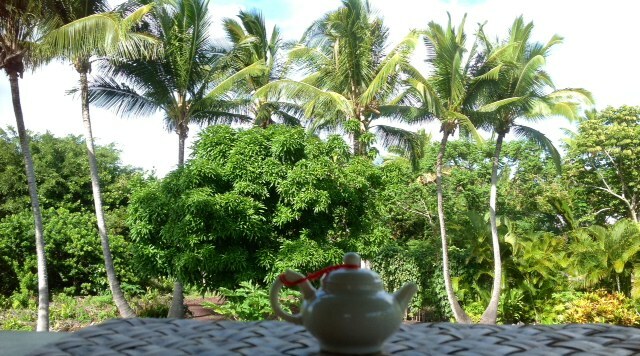 I assumed Hawaiian agricultural customs would be anally strict and I was a bit weary to have suspicious looking bits of sheng confiscated so I ended up choosing the teas which were commercially packaged such as the Douji mini-bricks or traditional tea-looking types such as lapsang souchong. But customs is rather lax on incoming travelers so I missed my chance to hand carry him some real puerh. I hid two chunks of sheng in my suitcase for an experiment in humidity. Israel had sent me samples from the cold dry climes of Montana and I wanted to see how much the humidity of the islands would revive it. I could see some of the smell faintly returning but still 10 days was not enough for these dried chunks of sheng nor for me. 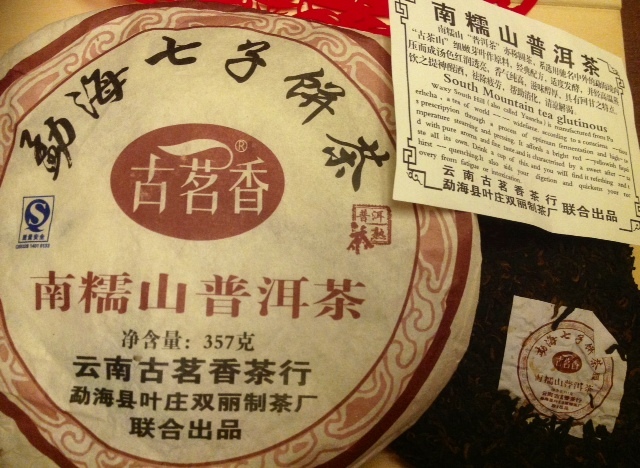 We drank a 2005 Nannuo together and K who had not tried puerh before said the sheng had brought him good focus. As their house is an ideal place to store sheng- I was spying for empty corners of their house but I'm still too sheepish to suggest anything yet. They invited another friend to dinner who was a daily shupu drinker of Menghai and Haiwan. At work he brewed the shu super strong and added milk and sugar and drank it as a coffee substitute. While I gaggled a little at the travesty, I'm curious to try it myself in any case as one never knows what's going to make shu palatable. 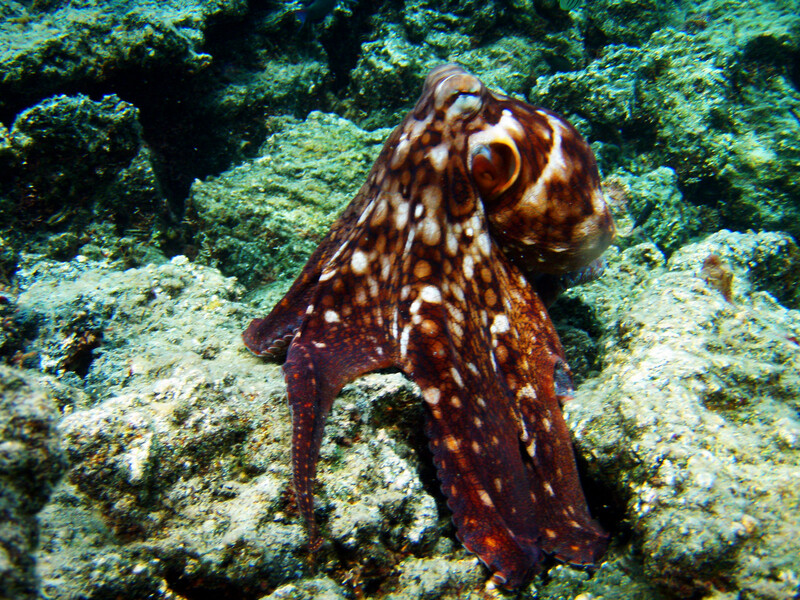 I spied this brilliantly moody octopus while snorkeling in the Kapoho tidepools. If any sea creature would be a puerh drinker, it's surely the octopus. While cheerful dolphins probably prefer crisp flavors of new oolongs and sencha, I really think octopi would really appreciate the complex evolving nature of sheng. And of course they are one of the few creatures dexterous enough for gongfu. It's hard to think one could still suffer such a heavy heart when subject to such abundant natural beauty. But so it is.